Happy New Year to all my faithful readers! It has been a busy holiday season, but now it is time to get back to business. For the first post of 2013, I thought I would share an alternate use that I recently discovered for my Filson 257 Briefcase Computer Bag. As I stated in my earlier review, for many people the Filson 257 is a little too large to carry everyday (unless you have a unique situation that requires the extra room). However, in addition to a briefcase, I think it makes a great carry-on bag too. *I am easily able to fit two casual outfits, two pairs of underwear and socks, as well as a few toiletry items into the Eagle Creek packing cube by rolling my clothes. Granted, not everyone can get away with packing this light, but this system works remarkably well for me on short getaways. The Filson 257 has just enough internal organization, coupled with a spacious main compartment to fill this role quite well. This bag now serves a dual role in my Filson collection (as both a daily-use bag and as a carry-on bag), which makes the cost ($275 USD) much easier to justify for those on a budget. Bottom Line: don’t think of the Filson 257 as merely a briefcase. It is a versatile chameleon in the Filson lineup. Well done. I actually have the 258 that I use when I’m lugging stuff around, otherwise I just use the 256. Not only is it great for the larger loads, but it also doubles as my weekend/overnight bag. What more could you want out of your bag? Well worth the investment if you ask me. I agree with you 100%. I could probably travel for a week in a 258:) They are such great bags and the added versatility of being able to convert a briefcase into a carryon is just icing on the cake. Hello. Love the reviews. Any chance to get one for the Pullman? Deciding between the medium duffle and the Pullman. Travel abroad twice a year (7-10 day trip), but would love a bag versatile enough to use for weekend trips as well. Hello. Hope you can do a comparison between the Pullman and the Medium Duffle. Usually travel abroad twice a year (7-10 day trips), but would also love something versatile that can be used for weekend trips. Enjoy your site so please write more reviews! I will be reviewing the Pullman over the summer after I have had a chance to put it through its paces. If you are considering the Pullman and the Medium Duffle, I would steer you toward the Medium Travel Bag. To me, it is the ultimate travel bag and offers better organization and structure than the medium duffle (which is HUGE in person); I also find it to be more versatile than the Pullman because of the way the Pullman opens. Stay tuned for the review and thanks for visiting the site. Great idea. I have a question. How thick are the leather straps that Filson uses on their bags? I have not seen any official measurements online, but by my ruler the thickness of the bridal leather (at the handle) is approximately 1/8″. Great info. Thanks. Keep me posted. .I am a fan of Filson. Interesting that someone noted the thickess of handle/leather. I am inquirying with Filson about typical handle bridle leather. One of my pieces is not nearly as thick from one handle to the other side handle and actually is not nearly as sturdy in observation and usage so far. Filson will check it out for me. Top notch service. I have noticed that there is sometimes not much consistency in the leather between bags, even when they are the same model. I once had a zippered tote where the leather on one handle seemed quite a bit thinner and was actually chipping out on the bottom (non-finished side). Filson took care of the problem right away, so there is nothing to worry about, but it is a bit of a hassle nonetheless. Thanks for one of the best Filson resources on the web. A question for you. Slightly unrelated to the post but here goes. Have you ever tried to re-wax a Filson bag? I have personally never attempted to re-wax a Filson bag for two reasons: 1) I live in a fairly dry climate and my bags don’t see much in the way of extreme weather or harsh conditions (I have found the factory coating to be very long-lasting and very robust); and 2) I really love the way that Filson bags naturally age and patina with time and I am always a little concerned that the new finish I apply will not look as good or as uniform as the factory finish. Sorry I couldn’t be of more help, but I will be sure to let you know if I ever attempt it. If you decide to do it, please send some pics and some comments and I would be happy to make a post out of the information in the future. I have waxed my rucksack and outfitter bag and highly recommend it. That’s what will help start to give them the patina we all love. The wax darkens the twill and attracts body oils and dirt to a certain extent, which will age them. You won’t be sorry. Thanks for your comments, Marcus…if you get a chance, send me some pics of the bags that you have treated and perhaps I can feature them on the site as an “Image of the Week”. I have never waxed any of my Filson pieces myself and I would love to know how they turn out. Thanks for the ideas on alternate use. I can’t wait to try them out. I haven’t dare to try and wax it yet as of yet. If I do it I’ll probably use my Greenland Wax (a bar of bees wax and paraffin). I’ve used that successfully on my Converse sneakers. I want to put some extra on the bottom of the bag in order to make it withstand the Swedish winter and the floors of Stockholm public transport a bit better. Mark, what wax did you use? I use the Filson paraffin wax. I’m sure your wax will work fine. Beeswax sounds good. Try it on a small spot. The wax rubs off on stuff at first then settles into the canvas. It does stiffen the fabric a little, but I don’t find it bothersome. Thanx again for a great blog. Yesterday I received a new 257 in tan. I bought a new one on Ebay. And a friend picked it up for me at hotel. And took it back home to Sweden. Do you know a way to adjust them or do you think I can get help from Filson? Congratulations on the new 257…I have owned Filson bags in the past where the snaps needed time to “break in” before they operated smoothly, but if yours will not stay closed no matter how hard you snap them together, then you may need to call Filson and see what they can do. I have had a couple experiences with customer service recently that left a little to be desired, but it is certainly worth a shot. If you are in Sweden, you may find that the most cost effective option is to take it to a leather worker (or shoe maker) and have him install a new handle for you. Keep me posted and let me know what you find out. I contacted Filson support and they asked me to send the bag ,back to Filson for replacement of snaps. 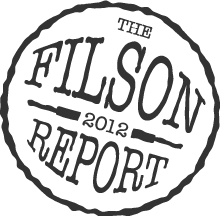 So, many thanx to Simon at customer supports at Filson and many thanx to you for a great blog. Hi Charles, I am looking for some advice regarding what Filson bag I should acquire. My basic needs are something that I can bring with me to work everyday. 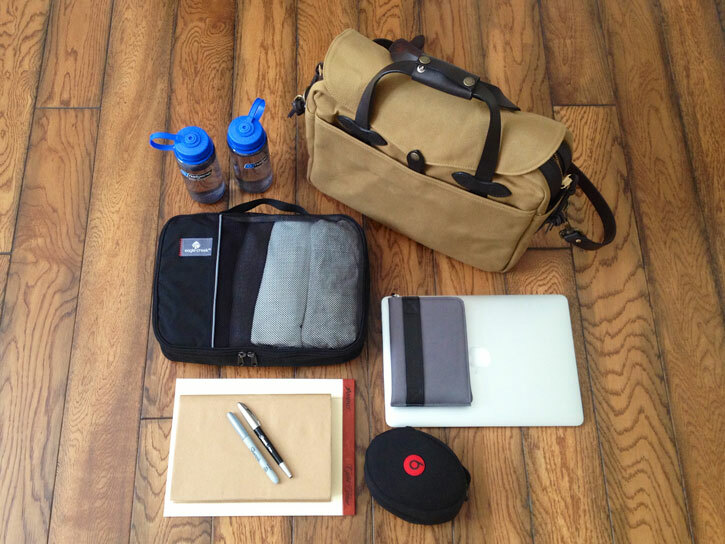 In my bag I usually carry a daily agenda, portfolio, moleskin, water bottle, and lunch. In addition to these items I often carry a one small sized text book, and folders with files. I like to have enough space left over to throw an extra sweater in there and possibly a thermos during the cold months. I am torn between the 257 and the Zippered Tote (the 261 I believe) and I have read great reviews of both. Originally I was drawn to the 257 because of its styling (I love the classic briefcase look) and because it looks so amazing after years of use. My main concern with the 257 was whether it would be versatile enough to use for work, but also function well for travel and for leisure (such as carrying downtown to a coffee shop with a few books in it). It seems like the 257 is a pretty versatile bag. Another concern was whether the weight of the 257 would make it impractical for my uses because I walk a mile and a half into work everyday. I haven’t been able to find any information about how much these bags weight empty. I am considering the Zippered Tote because it seems like such a simple and functional bag. Its so hard to judge a bag without any experience handling them. Any advise you could offer would be much appreciated. Thanks for your comment, Jane! I am sorry it took me a while to respond to your question. In your case, I would go for the Filson 257 because it offers much better organization for “office-type” loads, including files, books, computers, etc. The Zippered Tote (261) is one of my favorite Filson bags, but it is just one large cube inside so its best use-case is for items like sweaters, jackets, thermos, lunch, etc. The 257 is plenty versatile enough to carry these more freeform loads, but also works well with work stuff…so it is the best of both worlds. I hope this helps…let me know if you have any other questions. Thanks!